Scan on the go, translate immediately. 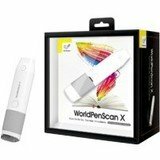 WorldPenScan X is a pen scanner & translator for iPhone/Android phone, iPad, tablets & Mac/Win. With this scanner, users can extract printed sentences and convert them into texts on the smart phone or PC. By integrating with translation software, WorldPenScan X can turn your smart phone into an electronic translator.